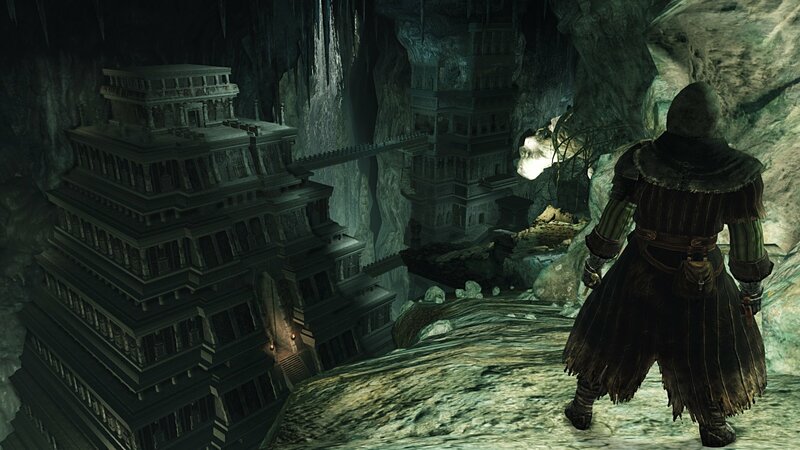 Today From Software revealed that they're working on three DLC packs for their action RPG Dark Souls 2. Crown of the Sunken King, the first entry of the Lost Crowns Trilogy, will be available in July. In Crown of the Sunken King, players set out to recover the crowns of King Vendrick of Drangleic. They'll travel to a new world, with caverns massive enough to hold entire pyramids. In their journey, they'll encounter new enemies and bosses. Braving these dangers will be more than worth players' time, though. The crown is said to "hold the strength of lords from times long past." Crown of the Sunken King will launch in the Americas on PS3, Xbox 360 and PC on July 22nd. The second chapter, Crown of the Old Iron King, will follow on August 26th. The trilogy will then be completed on September 24th with the release of Crown of the Ivory King. It seems like each DLC pack takes players to a new region. 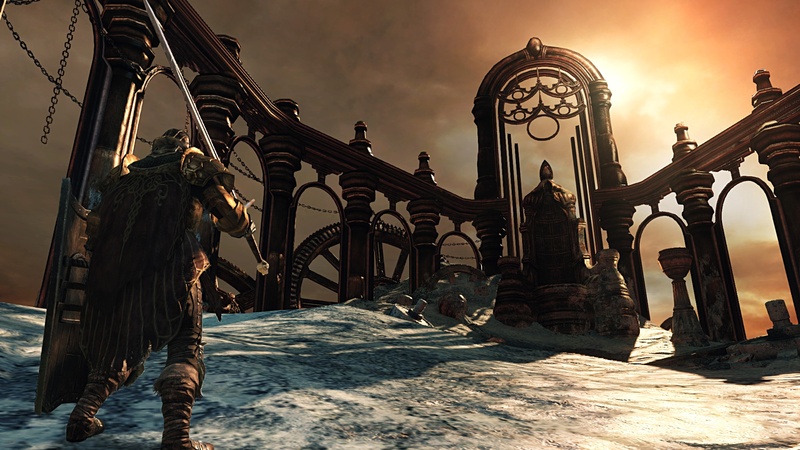 The Crown of the Old Iron King screenshot shows the player traveling through a mountain range. 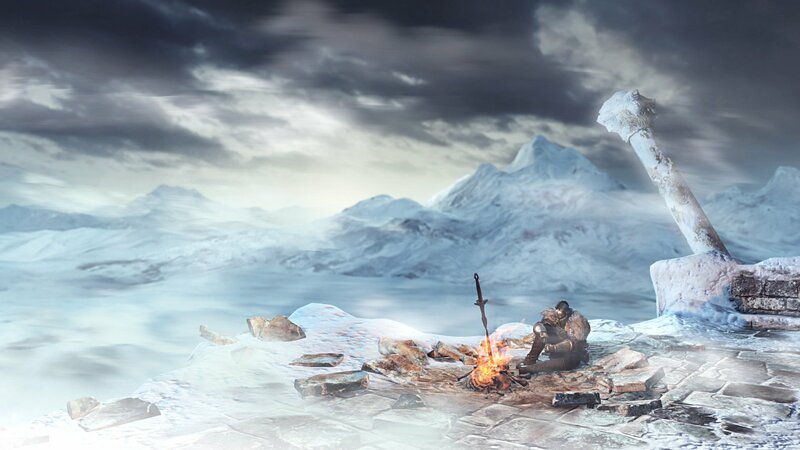 The image from the Ivory King DLC reveals an arctic setting for that add-on. “To say we are excited to unleash these three new chapters to Dark Souls 2 fans is an understatement.” said Chris Gilbert, Senior Vice President of Sales and Marketing at Bandai Namco Games America, publisher of the game. “Bandai Namco Games is very proud of the universal praise and enjoyment fans have both given and received from Dark Souls 2. The Lost Crowns trilogy and more specifically the Crown of the Sunken King will kick-off what will surely be an exciting summer of speculation and anticipation of the new battles, challenges, and triumphs to come amongst our most ardent fans." Each episode of the Lost Crowns trilogy will cost $9.99. PC gamers will be able to get the DLC packs for cheaper if they purchase in bulk, though. The $24.99 Season Pass offered through Steam provides access to all three DLC packs. From Software's DLC plans for Dark Souls 2 seem more ambitious than they were for the first Dark Souls. That game only received one add-on, Artorias of the Abyss. It's possible that these Lost Crowns DLC packs for DS2 are actually smaller than Artorias, though.